Possible to get support for Refined Storage's crafting grid, or do I have to contact them about it? Yes to this! I put together a small pack to play with my friends, but some of the recipes are conflicting, and we all use refined storage systems. I would like support for the refined storage crafting grid. Hi, it seems like your mod is causing a bug thats prevent crafting with my mod ^^, is there any why we can look into this so we can decide if the issue is on my or on your end ? Use shift-click while crafting. It won't do the whole stack, but locks the recipe temporarily. 1.7.10 is highly broken and needs an update because it doesn't work with tinker's construct. Should be fixed as possible. Is this client side only or should it be on both (guessing the latter but unsure)? Both client and server sides. Recipes are involved in both sides of the game. Greetings to the maker of the most useful simple mod there is(for big modpack that is :P )! 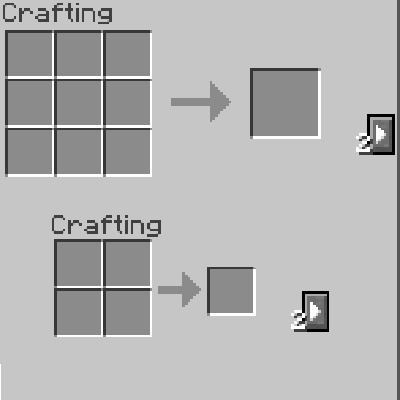 I'd like to know if there could be a way to enable Shift-Click for crafting multiple of something at once, that is not the first in the crafting list. Is this still an issue in the current version, if so it may be a deal breaker for using this mod? You should think to use the ore dictionnary for registering all the modded crafting table with the keyword "worbrench", it would help you a lot to add support for all the modded crafting table. Ore dictionnary is for comparing item crafting. It isn't going to help support modded workbench at all. Please update to 1.10, I tried the 1.9 version and it did not work. I can confirm. It works with 1.10.2! First of all, great mod. Secondly, there is a minor issue. If PotionShiftEvent is cancelled, the button still gets moved over as if it wasn't. If you could fix this, that would be great. This has been fixed in the official update for 1.10.